Christine Wekerle, PhD, is Associate Professor of Pediatrics at McMaster University. Dr. Wekerle has conducted research over the past 25 years into child maltreatment and related areas, particularly prevention of teen dating violence. She is leading a Canadian Institutes of Health Research, Institute of Gender & Health, research team to address sexual violence victimization among male youths (#CIHRTeamSV on Twitter). Dr. Wekerle has developed an arts- and case-based preservice course in child maltreatment knowledge and mandatory reporting. She cocurated the art exhibition “Picturing Wellness: From Adversity to Resilience,” at the McMaster Museum of Art. She is founding editor of the open-access journal the International Journal of Child and Adolescent Resilience (http://www.in-car. ca/), and is currently Editor-in-Chief for Child Abuse & Neglect. The Canadian Psychological Association named her Traumatic Stress Psychologist of the Year (2016) in recognition of her work on the Maltreatment and Adolescent Pathways (MAP) study of youths receiving child protection system services. Dr. Wekerle invites connections via Twitter (@DrWekerle) and e-mail (wekerc@mcmaster.ca). 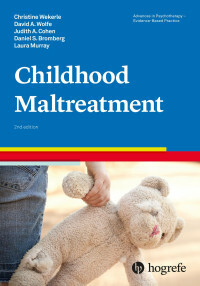 The new edition of this popular, evidence-based guide compiles and reviews the latest knowledge about the assessment, diagnosis, and treatment of childhood maltreatment, with particular emphasis on the current gold standard approach – trauma-focused CBT.